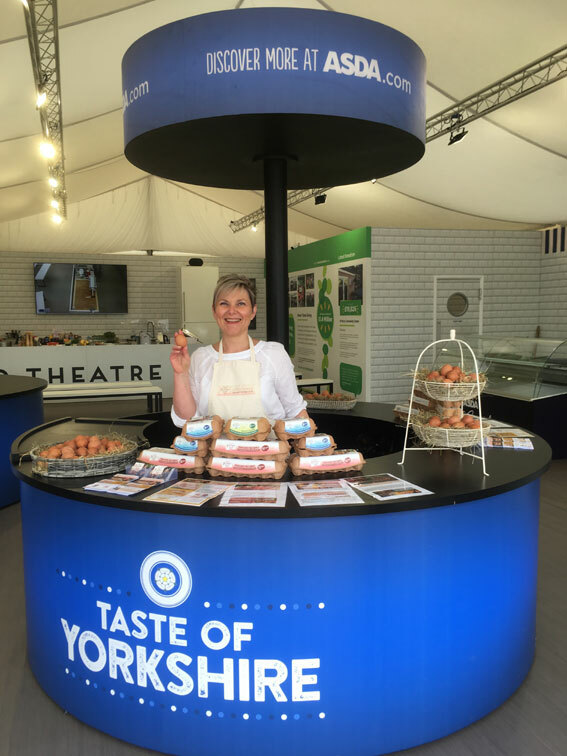 A ‘cracking’ time was had by James Potter Eggs on the sampling desk within the Asda show stand at the 2018 Great Yorkshire Show. Becky Griffiths (Customer services) and Andrea Thornton took ‘eggy’ bread to a whole new dimension, to showcase our fantastic James Potter free range medium eggs. We have decided to publish the recipes on here as Becky has been inundated with requests for them, it would be great to see photos of your finished creations or let us know your ideas for deluxe eggy bread goodness! Place bread onto greaseproof paper on a baking sheet and into the pre-heated oven. Cook for approx. 7-8 mins or until golden. Remove and drizzle with melted chocolate or anything else you fancy! Serve hot and fast. For a more chocolaty kick. Add 2 dessert spoons of Nutella to the egg mixture before whisking, this gives a chocolate custard style snack. Dip the bread slices both sides into the egg mixture until its all soaked up. Place bread onto greaseproof paper on a baking sheet and into the pre-heated oven. Cook for approx. 7-8 mins or until golden. Remove and sprinkle with grated parmesan cheese and chopped fresh basil. A quick Google show’s he’s right; as the world’s most common bird, scientists have said their fossilised bones will play an epoch-defining role for humanity. James Potter, 42, and his brother Adrian, 40, run James Potters Eggs – the first free-range egg producer for commercial sale in Yorkshire – after their mother Sue founded the company in the late 70’s. Driving to their Village Farm in Catton is mesmerising. Thousands of hens roam amongst endless fields planted with trees. Egg consumption is on the rise. Health stories are rife. The latest – an egg a day helps healthy growth in babies. Another says eggs should be prescribed as ‘nature’s multivitamin’ for everything from memory loss to diabetes. The protein clearly works. James and Adrian, are, like their business, fighting fit. From Sue’s 80 hens, they now have 300,000, with 55 employees, and production and packing facilities across three farms – their home Village Farm, Hoads Farm in East Sussex, and Wood Farm in Bedfordshire. The company has a £25 million turnover. Sue began the business for two reasons. She refused to feed her children caged eggs, after being bought up on a small holding. And she needed more money. The farm her husband Roger ran was small – 255 acres. Her husband, who grew up on a poultry farm, didn’t want anything to do with it, preferring arable farming. But once the birds metaphorically flew, he got behind it. Sue remembered doing the sums in her head after getting to 1,000 hens, thinking – this could work. Her eldest son Giles followed their dad’s footsteps preferring arable farming with a love of tractors. He runs the neighbouring Potters Plant Hire. Sue’s daughter Rebecca lives in London runs The Locally Sourced Food Company, a side business that sources and consolidates local products for supply to Asda and Tesco. Adrian and James had different plans. Both went to University (Agricultural Business Management and International Agriculture Management, respectively). Sitting in his first smoke-filled office (in the days you could smoke indoors), was the deciding factor for James to head back to the farm. Adrian went on to do a Masters in IT, but sitting behind a computer all day became stressful; he returned too. The brothers love the outdoor life and go bike riding, running and lift weights together, but always talk shop. Part of their fighting fit success is down to cultural shifts; the Jamie Oliver effect kicked in. But Sue was way before that time, nothing short of a pioneer in the industry. When she started out, she was mocked down the pub with farmers joking she’d be running around with a hanky cleaning the hens backsides, and the Ministry of Agriculture thought it ‘ridiculous’. “We’re not just packing eggs, we are real farmers, trying to innovate,” Adrian said. The brothers have invested heavily and adapted the latest technology and designs to fit with the hens natural instincts. Systems ensure good ventilation in the hen houses to keep ammonia down. Solar panels and biomass heat and cool the houses (as well as the packing centre). Controlling the temperature helps control feed consumption and egg size. Adrian has pushed the farm towards sustainability. The tree planting has increased biodiversity, and will be coppiced to fuel the biomass. James and Adrian Potter are the poster boys for eggs. “We’re exercise mad,” James said. 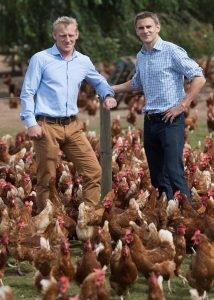 “Biking, running, and I used to play rugby.” When the brothers aren’t biking up hills, and running in the natural splendour of their 400 acre farm in Catton, they’re busy keeping happy 300,000 hens happy running one of the UK’s premier free-range egg companies. The high quality protein from the eggs, is clearly fuelling the brothers’ fitness. As consumers become more aware of health, and of the ethical source of the food they eat, free-range eggs are on trend. The brothers have turned their family business, James Potters Eggs, into a major player in the free-range egg market, not just supplying a sizeable chunk of the 34.5 million eggs that are eaten every day in the UK – their eggs are now supplied to Tesco, Asda, Sainsburys, Morrisons and the Co-Op – but leading the market when it comes to hen welfare. The woman who hatched the concept, was their mum, Sue Potter. Sue swam against the tide in the late 1970s to start her free-range egg production, starting with just 80 hens. She was mocked by the industry for putting hen welfare first, during a time cheap processed food and caged hen eggs dominated. The farm recently hit the headlines for playing Ed Sheeran to their hens, ‘Farmers are blasting out Ed Sheeran tunes after discovering that their hens lay loads more eggs when listening to the ginger-haired warbler,’ wrote The Mirror. It may have been a brilliant publicity stunt, but the message behind it rings true. Adrian and James have invested hugely to ensure their free-range hens are happy. They’ve adapted and invested in technology, with systems designed to fit the hens’ natural instincts and habitat, to ensure good ventilation in the hen houses, alongside better housing layout. The farm prioritises sustainability. Solar panels and biomass heat and cool the houses. The brothers have planted thousands of trees to increase biodiversity, and provide more of a natural playground for their hens, who roam over acres of fields, alongside bouncing rabbits with fluffy tails straight from a children’s picture book. In the early days, James says ‘the big players’ wanted the free-range industry to fail. The whole market was geared to cage hens, from the hens cages designed for cages hens to the supermarkets who prioritised cage eggs. It also helped that the British Lion stepped up, with better standards, becoming the UK’s most successful food safety mark. As well as continually improving the welfare of the birds, resulting in better quality eggs, the Potters are committed to the environment and community they live and work. 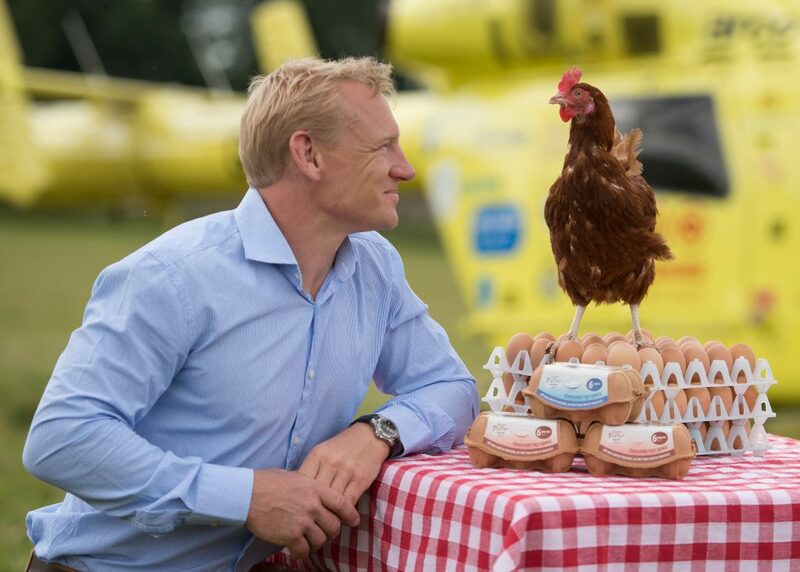 Alongside investing in sustainability and renewable energy, they donate 1p per dozen eggs to the Yorkshire Air Ambulance, raising £50,000 for the YAA to date, with £100,000 donated to charity across their whole company. The Potters all love eggs, and eat them daily. James and Adrian’s own children help collect the eggs, as they did when they were children. Sue said: “I love eggs, I don’t know what we’d eat if we didn’t. We have a lot of eggs! The boys were brought up eating them. I would give them a rusk and would crack an egg on it with some milk, and that was their introduction to solid food. It wasn’t the done thing then, but now, they’re seen as a really healthy staple – I read the other day they should be on prescription!! Perhaps it’s not a coincidence that they’re a picture-postcard of rude health and fitness. “Food for thought!” Adrian said. As one of nature’s most nutrient-dense foods, eggs have been claimed as ‘nature’s multivitamin’. UK health and heart organisations have lifted the previous limits to the cholesterol found in eggs, after finding no conclusive link. Eggs contain 18 essential nutrients; they include high quality protein, are rich in vitamin D, B2, B12, iodine, selenium and other essential dietary vitamins and minerals. Nutrition experts say that Brits are being seduced by new ‘superfoods’ wrongly believing they are more nutritious than less expensive everyday foods such as eggs. Eggs contain more vitamins and minerals than seaweed, coconut oil, almond milk, and chia seeds. A cheap source of protein and nutrients, avocado, almond milk and seaweed cost more than three times as much per portion. Family run James Potter Yorkshire Free Range Eggs has made hen welfare a hot selling point after installing biomass boilers and expanding its supply chain. 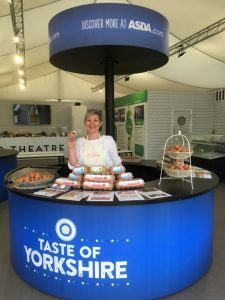 Based near Thirsk and with over 300,000 laying hens supplying Asda, Tesco, Sainsbury’s and the Co-Op, James Potter Yorkshire Free Range Eggs have now cracked supermarket chain Morrisons and will supply 54 of its stores. Brothers James and Adrian Potter started installation of the biomass boilers in 2016, which once complete will produce over two Megawatts of carbon neutral renewable heat. Biomass is part of the farm’s drive to become environmentally sustainable, adding to its existing solar power installations and thousands of native trees, which have been planted on the farm. Its policy is to sell locally to reduce food miles. The heat reduces ammonia build-up and results in fresher air for the hens to enjoy. Biomass also makes business sense, as the farm reports a noticeable improvement in egg production, whilst feed consumption has dropped as the hens require less energy to stay warm. Keeping the hens cosy results in better quality eggs. The British Free Range Egg Producers’ Association advises reducing stress in hens improves performance. The Potters recently revealed how their hens lay more and better quality eggs when they play them music by pop star Ed Sheeran, with songs Little Bird and Lay It All on Me. The brothers’ business ethics also benefit Yorkshire communities as one pence per dozen eggs is donated to the Yorkshire Air Ambulance. Last year, they raised £50,000; the new Morrisons supply chain is expected to net even more for the charity. The farm has built a firm reputation for high standards of animal welfare thanks to its ‘hen-centric’ approach and was recently awarded a Good Farm Animal Welfare Award by Compassion in World Farming. A PIONEERING free range egg farm is experiencing record production levels after hatching a plan to relax its hens by playing them hits by Ed Sheeran. Adrian Potter said the 200,000 free range hens on his 400-acre family farm stopped clucking, pointed their heads up and became noticeably more relaxed after he played tunes by the Grammy Award-winning singer at high volumes. Mr Potter, a third generation egg farmer whose parents set up the country’s second free range farm at Catton, near Thirsk, in 1970, said he had been astonished by the hens’ reaction, having previously played classical, jazz and Justin Bieber tunes to them. He said introducing the music and another innovations, such as tree-lined ranges, had contributed towards each chicken producing more than 300 eggs each during its lifetime, a rise of more than ten following what he admits was intended to be “a bit of fun rather than a scientific experiment”. Mr Potter said: “All of our systems are designed by ourselves and one of the comfort techniques we are keen on is playing music for the hens to listen to at key moments during the day to keep them as mellow and productive as possible. 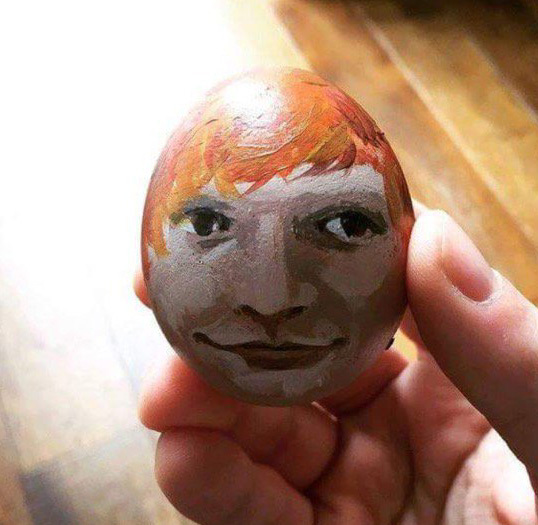 “The music they respond to most positively is Ed Sheeran and they lay more and better quality eggs. I think it is his tones they enjoy. “I’m an Ed Sheeran fan and the hens seem to be too – when Ed is playing the hens start laying. A British Free Rang Egg Producers’ Association spokesman said: “Reducing stress in hens improves performance. We are pleased to announce that James Potter Yorkshire Free Range Eggs has been awarded a Good Farm Animal Welfare Award by Compassion in World Farming in recognition of our commitment to farm animal welfare. Compassion’s Good Farm Animal Welfare Awards recognise food companies across Europe that are making it their policy to produce and source higher welfare eggs, meat and dairy produce. Compassion has run its flagship scheme, the Good Egg Award, since 2007 to celebrate organisations that source only cage-free eggs. The programme has now expanded to include the Good Chicken Award, launched in 2010, the Good Dairy Award in 2011 and the Good Pig Award in 2012. Over 311 million hens, chickens, pigs and dairy cows and calves are now set to benefit each year as a result of award winners’ policies. Latest figures from the British Egg Information Service (BEIS) highlight the continuing trend in the growth of free range sales, up 5% over the last year. This comes despite of the difficult choices most consumers face when trying to stretch their weekly food budgets and shows that consumers understand the benefits free range eggs have to offer in terms of quality and welfare. A campaign run by James Potter Yorkshire Free Range Eggs in February 2013, showed that in only costs the consumer £5.55 a year to make the switch from cage to free range eggs. Scores of businessmen and women are set to have a smashing time when they take on the region’s biggest new corporate challenge. The James Potter Yorkshire Marathon Corporate Relay will see teams battle it out for bragging rights to be crowned the fastest firm in Yorkshire this October. The event, part of the sold-out Plusnet Yorkshire Marathon, was officially launched today by sponsors James Potter Yorkshire Farmhouse Eggs and Celebrity Masterchef star – and former England footballer player – Danny Mills. 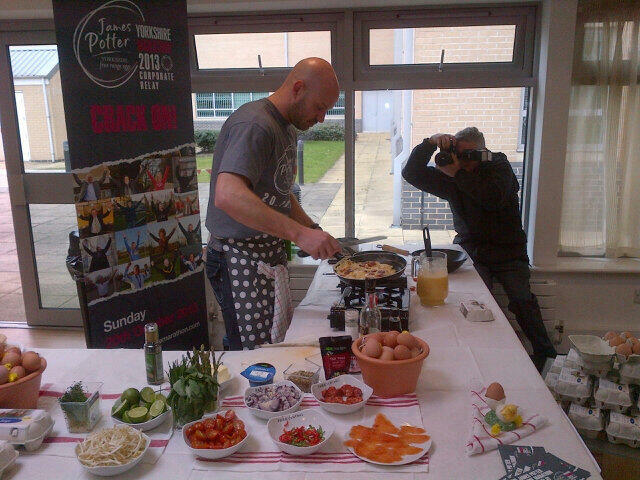 To kick off the countdown to the event, Danny was today [Thursday 28th March] rustling up egg-based snacks – using James Potter’s famous free range eggs – for staff at the York Science Park. He also took part in an egg and spoon race with local schoolchildren and helped dish out chocolate Easter treats. Danny, who will be leading a team in the corporate relay, said: “The Yorkshire Marathon is going to be the biggest sporting event in the region 2013 – and I’m really excited to be a part of it. “I’ll be running the first leg in a team and I’m really looking forward to soaking up the fantastic atmosphere around the course. “The James Potter Yorkshire Marathon Corporate Relay is a brilliant way for businesses to get involved – and try to take home the title of fastest firm! Director James Potter said the company was delighted to be sponsoring the new corporate event – and he and his brother were themselves already limbering up for the event. James said: “We are thrilled to be a part of the Plusnet Yorkshire Marathon. We are sure the event is going to be a huge success and we are very much looking forward to competing ourselves. “My brother Adrian and I have always taken a keen interest in keeping fit, particularly running and James Potter Yorkshire Farmhouse Eggs relay team is already in training. Yorkshire Bank is one of the first companies to have already entered a team in the corporate relay. Rick Warburton, Yorkshire Bank’s Head of Business and Private Banking in North Yorkshire, today threw down the gauntlet to other firms. He said: “The James Potter Yorkshire Marathon Corporate Relay was too good an opportunity to miss. “The marathon will be one of the biggest sporting events of the year, so we really wanted to be a part of it and the corporate relay is an ideal way for us to do just that. The Plusnet Yorkshire Marathon is being staged by a new company under the Jane Tomlinson’s For All Events umbrella – the legacy of the late fundraiser of the same name who raised almost £2m for charity through a series of amazing endurance feats. All 5,500 initial entries sold out just three days after the event was launched in January. A waiting list is now operating for the event which is supported by the University of York, York City Council, the Yorkshire Post, Yorkshire Radio and Capita Symonds. Jane’s husband Mike Tomlinson said: “General entries for The Plusnet Yorkshire Marathon sold out in an amazing three days so we know there is a huge amount of interest in the event. Yorkshire-based free-range egg company, James Potter, is on a mission to help keep the Yorkshire Air Ambulance (YAA) in the air, while keeping free-range eggs firmly on the nation’s tables. 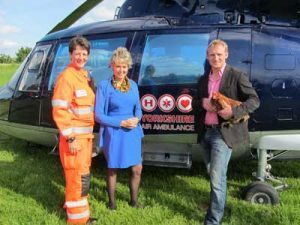 James Potter will be donating 1p from every pack of their dozen free-range eggs to the Yorkshire Air Ambulance, which requires £7200 a day to keep their two helicopters in the air. The charity relies solely on the generosity of the public to maintain this lifesaving service which serves a population of approximately five million. The partnership was launched on 14th June, with Director James Potter and MP for Thirsk, Malton and Filey, Anne McIntosh welcoming the Yorkshire Air Ambulance to the farm, accompanied by one of their free range hens. The family-run business, which started with a few hens so Mrs Potter could have eggs “the way they used to taste”, has grown over the past 30 years and now has 200,000 hens producing the finest free range eggs, available in ASDA, Tesco and Sainsbury stores across the region.